Most gardens require a yearly makeover to maintain their optimum appearance. Shaded Leaf’s Clean Up is an intensive service that enhances the visual aesthetics of your property and promotes proper growing conditions. Our horticultural knowledge, professional experience and attention to detail will bring your existing landscape up to standards that can be maintained throughout the growing season. Weeds, leaves and debris are not only unsightly; they can harbor insects and disease that could damage your landscape and perhaps your home. Shaded Leaf thoroughly and carefully will remove these items from your property. A sharp, deep edge on landscape beds provides definition and separation from grassy areas and hinders unwanted growth into your beds throughout the year. We edge all your beds by hand to create this elegant and beneficial effect. Well-established plants occasionally need to have undesirable growth removed to improve their health and appearance. Ground covers and herbaceous perennials should be trimmed back to clear the way for new growth. Shrubs and small trees may require the removal of damaged, diseased or dead branches. Some plants may need renovation pruning in which old growth is removed to encourage the new. 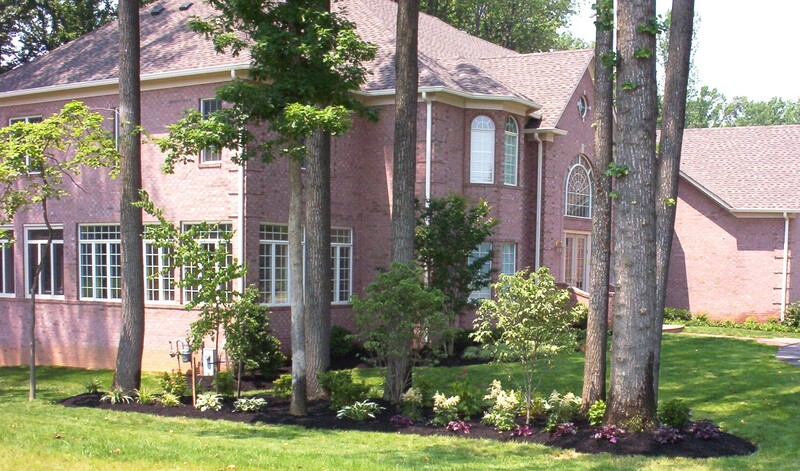 Shaded Leaf can outline and perform the appropriate pruning program to fit your needs. A suitable thickness of mulch insulates plant roots from rapid temperature changes and helps retain moisture throughout the year. It also discourages weed growth. Conversely, an excessive layer can inhibit the proper water and nutrient exchange and promote unwanted gases. A thick mulch layer could promote weak surface roots that are more susceptible to drought and temperature extremes. For these reasons, Shaded Leaf will evaluate your mulch thickness; then using a triple shredded hardwood product, we will apply an appropriate thickness (usually 2-3 inches) to all your beds. Plants, very much like all living creatures, require a regular supply of nutrients to maintain their health and appearance. Shaded Leaf will apply an appropriate (4-6-4 or 5-10-5) granular fertilizer to all your ornamental shrubs and trees that are up to 15 feet tall.